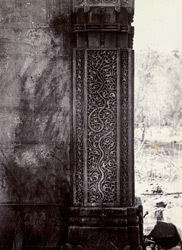 Photograph of a carved pillar from a ruined tomb at Champaner in Gujarat, taken by Henry Cousens in the 1880s, from the Archaeological Survey of Western India. This is a view of a ruined tomb, built after a new city was founded at Champaner by Sultan Mahmud Bergada (r.1458-1611) after he took the city in 1484. In the 'Archaeological Survey of Western India, vol. VI', Burgess wrote, "Among those remains still found in the forest, attention may be drawn to the ruin of what must have been one of the most ornately carved tombs in Gujarat...The dome has fallen in and the whole is a mere shell. It is not at all large, and had only one arched entrance on each side, with a blind arch on both sides of these entrances. The upper portion of these blind arches were ornamented with niches such as are common on the bases and by other rich carving; but the pilasters at the corners and jambs of the doorways are carved in patterns of the richest designs. Except the two famous windows in the Sidi Sayyid's mosque at Ahmadabad there is hardly anything elsewhere to match these twelve pillars in richness and variety of decoration."